The EU General Data Protection Regulation (GDPR) deadline is approaching. You may think you’re immune from its impact, but if you do business with customers in the EU, think again. It’s time to rethink your organizational processes around compliance. 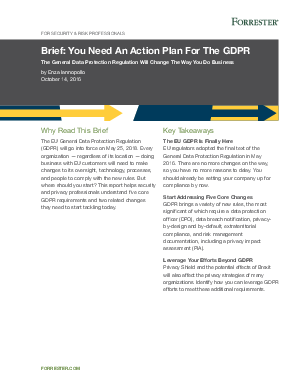 This Forrester Research Brief helps your security, regulatory and privacy teams grasp the five changes necessary for GDPR compliance.